Bugatti Type 51 Limited Edition Print of the Bugatti Type 51. Trying to capture the exquisite detailing, typical of Bugatti, on my drawing of the Bugatti Type 35 and also it's successor the Type 51, introduced in 1931 and winner of 5 Grand Prix that year. Following the success of the Bugatti Type 35, the Bugatti Type 51, its engine now with twin overhead camshafts and and a supercharger, won the Monaco Grand Prix in 1931 in the hands of Louis Chiron. 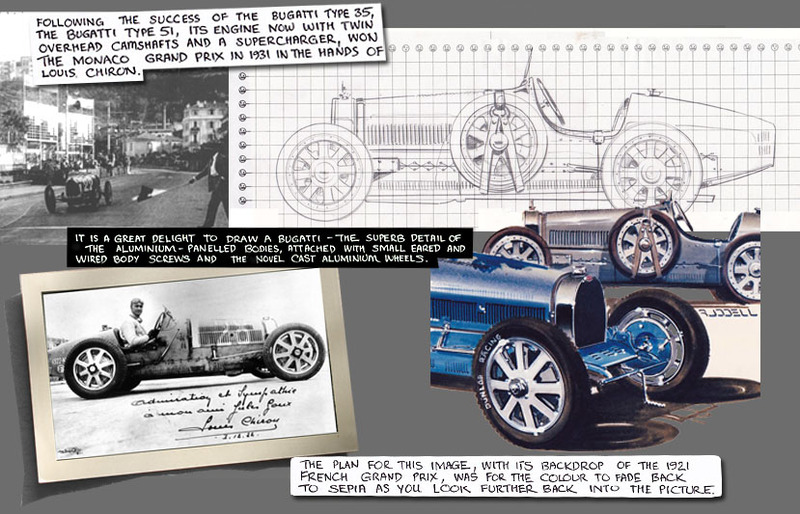 It is a great delight to draw a Bugatti – the superb detail of their aluminium-panelled bodies, body panels attached with small eared and wired body screws and their novel cast aluminium wheels. Every component was meticulously crafted! The plan for this image, with its backdrop of the 1921 French Grand Prix, was for the colour to fade back to sepia as you look further back into the picture.